We'll help you hit the high notes. Get marketing solutions that sing your praises. 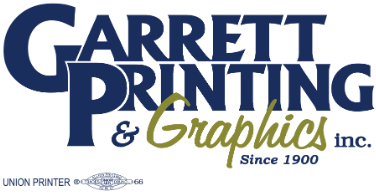 Welcome to Garrett Printing & Graphics, Inc. Thank you for visiting Garrett Printing & Graphics of Bristol, CT. To place an order or request an estimate, please click the appropriate tab at the top of this page. If you have your own customer portal set up, please click "Customer Login" in the blue bar at the top of the screen to access your Document Library, or to find out more about creating your own portal. To learn more about us, browse through our "Company Information" section. Driving directions can also be found under the "Location and Hours" section of Company Information. To see our list of frequently asked questions and for a glossary of terms, search our Resources & Support area. If there's anything we can do to improve our site, please let us know! Enjoy your visit! Shop our vast collection of wearables! Add your imprint in embroidery or screenprinting. Once you've found the perfect garments, give us a call or email us for an estimate. Didn't see what you were looking for in our other Branded Apparel link? There are several things that make the holidays special. We place our holiday cards near the top. Send your sentiments this year with stunning holiday cards that are certain to inspire. Business isn't built on nameless prospects, it's built on relationships with people. With our variable data printing, you can deliver a personalized piece, showing your supporters they're more than just another address.